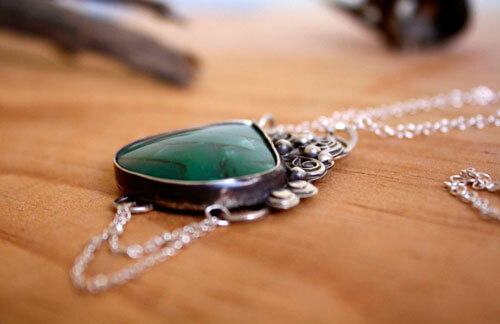 It is made of 925 fine silver made by hand in my workshop and a beautiful deep green agate. 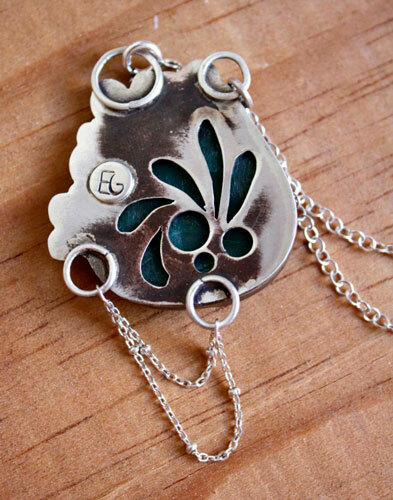 This pendant shows a floral and vegetal design. 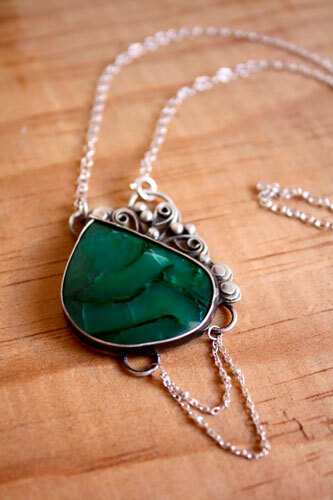 Small teardrops ornate the shape of the stone and are filled with filigree wire and sterling silver balls. 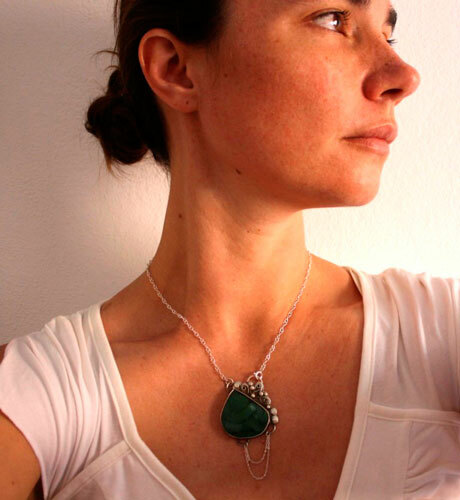 I called this necklace "Amazon" because of this intense green agate in emerald tones that I set and that gives a contrast with the oxidized sterling silver. The natural lines of the stone make me think of this giant river and its strength. The Amazon is also the luxuriance of the vegetation, abundance. That is why I dressed this pendant of a large plant motif consisting of spirals and circles, evoking the leaves, petals and fruits. On the lower part of the pendant, I hooked a nice silver chain with two rings, an evocation of the lianas that hang in this tropical vegetation. I also hand sawed a beautiful pattern on its back to give it an extra baroque and French touch. This pendant measures about 4 x 3.5 cm. The total length of the necklace is 45 cm. The fastener allows you to clip the necklace in front. 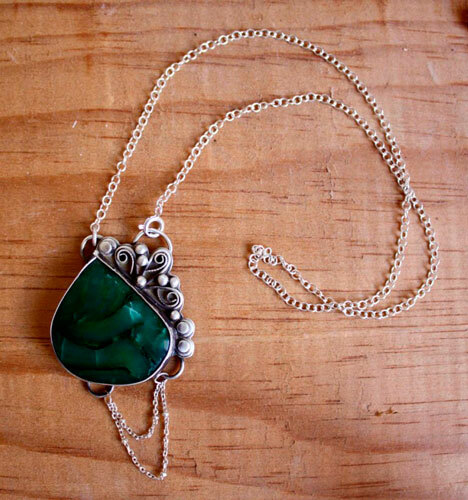 This necklace will be perfect for a person who likes unique jewels, romantic style and rustic finish at the same time. It will look good on a beautiful neckline. 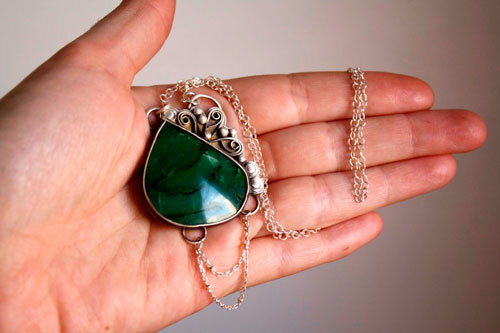 Tag: pendant, silver, stone, agate, green, emerald, amazon, rustic, oxidized, romantic, necklace, original, plant, floral, flower, gift, birthday, jewelry, unique, baroque, jungle, forest, tropical, lush, petal, river, leaves, nature, abundance, fruit, lianas.